Joe Hockey is promoting a 'Social Civil War' - pitting even low wage workers as well as the well off and the middle class against the welfare-dependent. In response to this regressive campaign, Labor cannot accept the Liberals' 'terms of debate' but must propose its own policy agenda for just and socially fair Australia. nb:an Apology to 'The Australia Institute'; In a typo I accidentally referred to that left-wing think tank when I should have referred to the right-wing 'Sydney Institute'. The typo has been corrected. 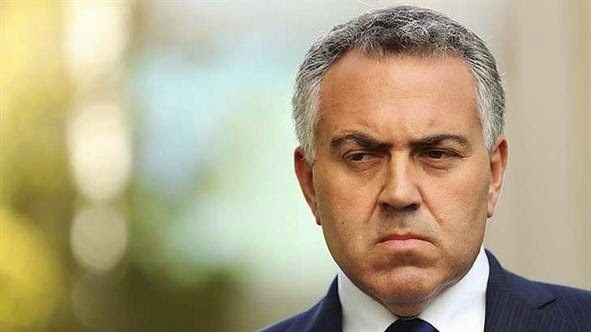 Australian Treasurer Joe Hockey has been “on the attack” recently; targeting Australians who for whatever reason have been welfare-dependent, or have benefited from welfare during their lives. Specifically, Hockey asserted that one in ten Australians were welfare-dependent in some way, with a total welfare bill of $146 billion a year in a $1.6 Trillion economy. Apparently, this is meant to produce a ‘shock and horror’ effect amongst an electorate which is considered to be ‘narrowly self-interested’, without any sense of social solidarity, or of the gains to be had through such reciprocal solidarity and also the various forms of collective consumption. More particularly Hockey has alluded to those dependent of Youth Allowance, Newstart, the Aged or (military) Service Pension, and the Disability Support Pension. Apparently in an attempt to stir up division and resentment, Hockey argued that “the average Australian”, whether “a cleaner, a plumber or a teacher” works over a month every year to provide for the nation’s welfare bill. (Herald-Sun, June 12th, 2014, p3) This ‘political play’ to narrow financial self-interest ignores the benefits of reciprocal social solidarity via welfare. In an infuriating furphy, Hockey promoted his personal interpretation of “equal opportunity” as opposed to the ‘straw-man’ of “equality of outcomes”. On this basis he also attempted to defend the Federal Government’s Higher Education ‘reforms’ – which will see a fee deregulation (some of the highest fees probably reaching well over $100,000), as well as a reduction in the repayment threshold for student loans, and also an increase in the rate of interest paid on those outstanding loans. (‘The Age’, June 13th, 2014, p 8) This will affect women - whose working lives are often interrupted. In response to Hockey one of the most important of his assertions to deal with is that ‘straw-man’ argument of ‘Equality of Outcome OR Equality of Opportunity’. Instead of this false dichotomy it is much better to frame the issue as a matter of Fairness. Pretty much no-one – even on the far Left – want full ‘equality of outcomes’. Rather there is support for redistribution via the social wage, welfare state, social wage, and forms of social insurance for the sake of distributive justice. (as opposed to full equality) ‘Equality opportunity’ is part of the picture; but so too are ‘fair outcomes’. Here, ‘distributive justice’ assumes that the outcomes gained in the labour market through ‘supply and demand’ of skills – and ‘consumers’ capacity to pay’ are not necessarily just. For cleaners, as well as hospitality, child care, and aged care workers – people whose work deserves respect –there is an argument for intervention and redistribution as the means of achieving fairness. (not absolute equality) Those measures of redistribution – through the social wage, tax-transfer system, welfare state, labour market regulation - do not have to put the remuneration of a cleaner ‘on par’ with a surgeon, for instance. But all workers who face disadvantage and injustice in the labour market deserve fair outcomes; and those means of intervention are effective means of providing those fairer outcomes. Arguably Joe Hockey is is attempting to ‘divide and rule’ the nation. An element of divison is inevitable – perhaps even desirable – in a democracy. The point of democracy after all is ‘to set oppositions free’ and resolve them through democratic processes. But Hockey is inciting resentment against the vulnerable – no matter what he has said to the contrary. This is qualitatively different than attempts to tax the wealthy – which Australia’s Conservatives try and dismiss with hypocritical howls of ‘class warfare’. More specifically, Hockey’s approach comprises a ‘bold gambit’. Low-income workers themselves are to be ‘played off against’ the welfare dependent. Rather than raising minimum wages and conditions, or improving the social wage – they are urged to express resentment against the vulnerable. The ‘endgame’ is a US-style class system. The very wealthy are to be ‘untouchable’ and largely untaxed lest we be bombarded with cries of ‘class warfare’. Taxes are to be ‘simpler’ and ‘flatter’ – that is, more unfair. The middle class are to provide ‘the base of stability’ for Conservative political forces: their lifestyles supported by the exploitation of the working poor. And the working poor – indeed, the ‘underclass’ - are to be ‘disciplined’ by fear of homelessness and destitution – with the erosion of the ‘social safety net’. Crime will also likely escalate as a consequence of desperate inequality; but this insight is to be ignored for the sake of a warped, and ultimately immoral, notion of ‘meritocracy’. How this ‘meritocracy’ is meant to work without real equality of opportunity (especially education); while there is ‘hyper-exploitation’ of the working poor; and amidst ‘windfall’ inheritances in the most privileged families - is not really considered by today’s Conservative Ideologues. It is ‘an inconvenient truth’. In Hockey’s ‘grand statement’ to the ‘Sydney Institute’ those designated as ‘leaners’ are to be reviled. There are Aged Pensioners. (who have largely paid taxes their whole working lives) And yet no mention of self-funded retirees – whose liquid assets alone can range well over a $1 million – but who receive enormous superannuation tax concessions. The total bill of those concessions will soon cost the nation over $40 billion a year. As Richard Denniss of the Australia Institute observes: "the top 5 per cent of income earners get a third of the benefit, and the bottom 20 per cent get literally nothing." Then there are the disabled. Underlying resentment against Disability Support Pensions is the notion, for instance, that ‘mental illness’ is not to be seen in the same way as ‘extreme physical disability’. We’re talking about people with anxiety disorders, depression, schizophrenia, bipolar disorder... Something Andrew Robb could probably advise the Parliamentary Liberal Party about: and yet from a cursory web-search he does not appear to have done so. Often the ability of these disability pensioners to work is intermittent at best. And the underlying assumption that they are to be looked upon suspiciously – as ‘rorters’. Hence ‘Disabilitywatch’ has noted moves by the Federal Government to ‘tighten up’ assessment for eligibility, including ‘work for the pension’ for those deemed able to work at least 8 hours a week. (now to be reduced from 15 hours a week) But arguably if a person is living in poverty due to disability, and may be capable (intermittently) of some work, then perhaps their payments could be complemented fairly in return for voluntary community work, without the threat of losing that pension altogether. Instead we are getting another dose of labour conscription – this time for some of the most vulnerable of all. In conclusion: a movement is building against Hockey’s ‘Robin Hood in Reverse’ Budget. In Melbourne the day before this article was written the ‘Bust the Budget’ rally amassed around 20,000 attendees – perhaps more. The ‘Your Rights at Work’ campaign against John Howard’s aggressively in egalitarian ‘Work Choices’ labour market legislation attracted the support of millions. Today the same is possible if we stand collectively against Hockey’s cynical ploy to ‘divide and rule’ the country. Yet Opposition Labor Party leader Bill Shorten is ‘treading lightly’ around Joe Hockey’s appeal to divide the nation – a ‘nation at war with itself’; a war of so-called ‘lifters’ against so-called ‘leaners’. So far he refuses to reject this characterisation of Australian society outright. But Labor cannot accept a political discourse which is propagated on the Liberals’ terms. Labor needs to respond to Hockey with its own powerful narrative: of a society based on mutual and reciprocal social solidarity. This means promoting social security and social justice through a range of measures including labour market regulation, welfare, a progressive tax mix, the social wage, and various forms of ‘collective consumption’. Not a society of ‘absolute equality of outcomes’ – but a FAIR and JUST society! In a practical sense that must mean a decisive break on the part of Labor with the mindset of ‘small government’. Labor must ‘go on the policy offensive’: advocating both old and new policies. That includes Gonski and the National Disability Insurance Scheme. But it must also include National Aged Care Insurance and Comprehensive Medicare Dental, amongst range of other policies. The way is open for a progressive counter-offensive mobilising millions. Labor, the unions, the welfare sector, and all progressive social movements - must seize the initiative.